Let's schedule a little mini jam! Topic: Let's schedule a little mini jam! As you all probably know the days are getting shorter. Before it's cold I would love to see my fellow traceur and traceuses (hope I spelled that right) show up for a little mini jam in Omaha! If we could schedule and day or two for the jam that works for everyone, well that would be just swell. Or better yet how about you guys tell me the days that won't work. I'm thinking late September early October. If we could also get a head count of people who would show up that would be awesome to! Re: Let's schedule a little mini jam! I'm free almost every night, except for Wednesday(FCA,Youth Group). Sometimes on Tuesdays and Fridays I have pep band but idk. I'm Down. Schedule a specific date and I will cancel everything for that day. I live in Ralston, so if anyone on here lives near there, hit me up. So I am thinking the first Friday and Saturday of October, if not the second weekend of October. Now lets pick the spots. 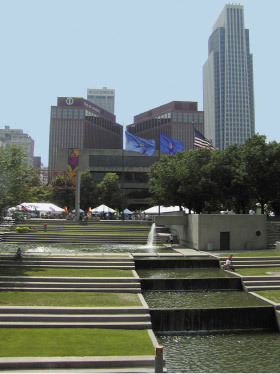 I was thinking downtown Omaha for one of the days. But where would you guys like to go? Papillion La vista High school is under construction, and they have a lot of good free running stuff. 1st Friday and Saturday of Oct. don't work well for me, i have homecoming. but the week after on the 12th I'll be at Old World Market for my senior pics. I'll be doing some parkour/freerunning shots. around 4:00ish I think, I'll have ot get back to you on that though. So how does Friday and Saturday (17th-18th) sounds? Okay so I know this is a little late notice, so we can reschedule if need be. That would for sure make up one solid day. Then for day two I I was thinking Pipal Park(http://maps.google.com/maps?hl=en&client=firefox-a&rls=org.mozilla:en-US:official&hs=4Ca&q=omaha%20pipal%20park&um=1&ie=UTF-8&sa=N&tab=wl), along with a school park about 6 blocks away. If this weekend works for you all 3 people that are coming give me the times that will work and we can set it up. Sorry Rockwell but I'm gonna have to reschedule. Where do you usually go on Mondays/Thursdays? Hey it's fine. really it my own damn fault for taking so long to make a decision. Obviously this weekend is not going to work. When do you guys want to meet up? Okay so the weather looks good on Friday and Saturday. I haven't checked in with you guys because it looked like it was going to rain all week. But looks like it's gonna stop Thursday. So we all ready to jam? If so I'll make up a schedule. but really we need to plan one of these! so how about sometime in November? Tell me the days that won't work.